In 1877, Thomas Edison marked an epoch in the history of the music industry by inventing the phonograph. By that time, there were other recording devices in use as well, but Edison’s invention was the first to be able to reproduce the recorded sound by inscribing music onto a sheet of tin foil rolled up on a cylinder. Technological breakthroughs allowed the manufacturing of turntables and vinyl records much cheaper and, hence, more accessible to the public. However, with the introduction of Compact Disc (CD), the records became obsolete as CDs were more practical in terms of costs, portability, and storability. Surprisingly, vinyl records have made a grand comeback. This has revived the construction of affordable turntables with artists publishing their albums on vinyl along with other formats. This vinyl revival is meant to stick around for long as people start to make a switch away from computers and back to the turntables. These vinyl records stand unparalleled to the digital tracks due to the sound quality and the unique feeling they bring along. Turntables are becoming trendy with time as the newly interested masses search the markets for modern turntables. However, that does not rule out the fact that many vinyl users still adhere to their very likings for a vintage version of the turntables. It would not be fair to say that these users are simply “nostalgic” because these vintage turntables have much more to offer. Why Should You Go For Vintage Turntables? The contemporary era of “Internet of Things” has transformed the way we spend our daily lives. When almost every task we perform is embedded on the internet, why should you go for a vintage turntable that features outdated technology? Modern turntables may be easy to use, but the experience you get isn’t the same as you’d get from a vintage model. First of all, even though the technology of modern turntables brings a lot of new features to the [turn] table, their operational and running costs can be higher. Secondhand record players are as much – if not more – capable of delivering good quality music. More often than not, these tried-and-tested machines possess more durable hardware, allowing the vinyl record to last longer. Their strong gears do not only make these turntables quite reliable but also guarantee great sound quality. Secondly, a lot of new models do not allow you to set all the relevant parameters, such as the tracking force that the stylus applies to the record and the balance of the tonearm. With such incapability, running the turntable on settings that are incongruous to the vinyl record can damage them. Sure, you could go for the easy purchase of a modern turntable. However, if you want to enhance your record experience, why not go a bit old-school by investing money and time into a vintage turntable that offers good quality, as well as, aesthetic value. If you are amongst the vintage lovers, you may be interested in knowing which turntable manufacturers deliver the best vintage turntables that suit your requirements the most. What Should You Look For In a Turntable? There is nothing better than experiencing the pleasant sound of a good vinyl record, but we understand that buying a good turntable can be a hefty task. We will try to clarify things, so you can positively progress with your selection of the best turntable. Before we move forward with our choice of 10 best turntables, we would like to highlight a few important features to keep in mind when buying a turntable. Older devices tend to last much longer than the new ones. This is mainly because the primary purpose of contemporary production is mass consumption as opposed to older products that were particularly made to last long. Companies opt for lighter material for manufacturing because: firstly, it allows them to cut down on costs and maximize their profits; and secondly, it allows for frequent purchases as the lighter material offers low reliability and durability, which again is driven by strong profit motive. We suggest that you should generally avoid buying turntables that use plastic and go for turntables that are made of steel, wood, and perhaps even aluminum. Vintage models are usually made up of these materials guaranteeing longevity. The stylus is the part of the turntable that is directly in contact with the vinyl record. You want to ensure that your cartridge is set with the ideal weight setting. You do not want too much weight on your records as this may result in wear and tear via excessive drag nor do you want the tracking force to be too low since this may hinder good sound quality. Vintage models usually allow you to change the tracking force by changing the position of the stylus and the cartridge. Direct Drive: Direct drive connects the axis of the motor directly to the platter. The main benefits of the direct drive are that it allows the platter to achieve the required speed relatively quickly and to have better control over the system. A direct drive system is also considered to be more reliable and durable. However, the vibrations resulting from friction may yield a lower sound quality. Belt Drive: In a belt drive system, the motor is not in direct contact with the platter. It is rather an elastic belt that transfers the motion of the motor to the platter. The belt absorbs the vibration from the motion and provides a smoother listening experience. However, the belt needs to be replaced from time to time as they are vulnerable to stretching, heating, and cracking. You should carefully look into these features and select the option that suits you the most. I would prefer a wooden belt-drive system for longevity and low frequency of vibrations. Now let us look at our top 10 choices of vintage turntables. Fluance RT81 High Fidelity Turntable comes with a simple, vintage appearance that adds a classic delight to its features. It can accommodate traditional LP and EP vinyl records. It is quite an affordable and well-built model that is easy to operate. It also comes with an AT95e elliptical stylus dual magnet cartridge, which puts way less weight on the records without compromising on the sound quality. For a captivating music experience, Fluance RT81 should be your go-to music player. You will be enthralled by the quality of music this turntable has to offer. This turntable is convenient to set up and does not require continuous fiddling with the settings. Therefore, Fluance RT81 is an excellent choice for beginners. Electrohome Wellington 4-in-1 offers a great vintage look with fine details. The old-fashioned turntable provides you with fascinating nostalgia coupled with exceptional sound quality. Do not let the vintage look fool you as it comes with modern functionality, as well. The belt-driven turntable supports 7-inch, 10-inch, and 12-inch records. The strong built-in dual range speakers in the system allow for high fidelity sound whether you are using vinyl, radio, and even your smartphone. The decent wood finish on the retro system makes for a great décor whether you place it in your home, restaurant, or perhaps even your workplace. Built-in stereo speakers with rich, room filling sound, housed in an all wood acoustic cabinet for optimal audio performance. Connect your headphones for private listening. Record any vinyl album to MP3 through a built-in USB port without connecting to a computer. Just plug in your USB drive and press record - it's that easy. Rega is a renowned British manufacturer known for some of the best turntables in the market. Any anglophile will agree when we say that Rega offers exceptional value for money. Their legendary Rega Planar 1 (RP1) comes with great convenience along with budgetary efficiency. RP1’s slim design makes it suitable for any setting and also makes it a great travel companion. The aluminum platter used in RP1 is much stronger as compared to other models. The belt drive comes with a stepped pulley that allows for manual adjustment of the speed reducing chances of damage. However, if you listen to a mix of 33s and 45s, you might get slightly annoyed by having to make changes to speed. The main advantage of this turntable is that it’s adjustable and straightforward, which makes it one of the best entry-level hi-fi turntables. If you are on a tight budget, RP1 seems the right choice for you. Thermoset, gloss laminated plinth with vastly improved appearance and new ergonomically positioned on/off switch located on the underside. Two stunning plinth finishes available, gloss black and gloss white. Pyle PTCD54UB comes with a classic vintage look, yet hosts advanced characteristics. The modern technology employed by this turntable is compatible with any Bluetooth-enabled device. You can also control some functions, for instance, if you want to repeat a song, via remote control. This turntable is the right choice for you if you are looking for a multifunctional turntable that’s also affordable. The Technics SL-1210MK5 is an upgraded version of the 1210 MK2. The quality of components is what makes this turntable outshine amongst its cheaper counterparts. The quartz-synthesized direct drive takes negligible time to bring it up to the required speed while eliminating vibrations from the direct contact between the platter and the motor. The body of this turntable is made of high-quality aluminum, and the heavy rubber base allows the device to maintain its position. The anti-skate feature in the model helps to control the stylus path better. All these extra features highlighted above come with an extra cost, as well. So, this turntable is suitable for you if you are a professional DJ or perhaps merely a high-end user. It’s been quite long since the Linn LP12 turntable was first introduced in 1973; however, it is still held in high esteem today and is considered to be one of the most complete and capable decks around in the turntable market, especially if you’re a vintage lover. The sound of LP12 is rhythmical and possesses excellent time adherence. Apart from the quality it offers, the main appeal comes from its upgradability. You can update your LP12 and bring it up to current standards, albeit the pricing of upgrades is nonlinear. So, you should carefully select your options. The unique chassis design along with the ability to install upgrades makes LP12 a highly dynamic turntable. It’s the right choice for you if you plan on switching to modern technology sometime in the future. Technics introduced their SP-10 with incredible direct drive technology when the direct drive vs. belt drive debate was culminating. This is why SP-10 – with its EPA 100 arm and a Grado Statement Sonata cartridge – is known as one of the best technics turntables. Although this Technics turntable is quite unattractive, the phenomenal direct drive performance is why this turntable stands out. The deck is formidable, heavy, and well-built. If looks and modern features don’t matter much to you, and sound performance is your primary goal, then this seems like the kind of turntable you might want to check out. 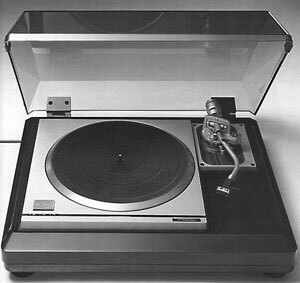 You can find this antique turntable easily on the following link: Technics SP-10. Like other turntables in this list, the 1byone Bluetooth turntable also makes use of modern technology, such as USB and Bluetooth compatibility. The belt-driven turntable is largely wood-based. There is no means to adjust the tracking force via counterweights. However, the arm is light to not cause any playback issues yet sufficiently weighted to stay in place. The stylus and cartridge of the equipment are replaceable. The turntable comes with built-in stereo speakers. This will save you some space as there is no need for additional audio equipment. The sound quality is astonishingly great, especially in terms of the volume. However, the frequency range of the speakers is limited. Nonetheless, it should be kept in mind the speakers is not the primary feature of this turntable, so it’s fairly acceptable that the speakers are not of the best quality. This turntable is the right choice for you if you are mainly looking forward to playing your vinyl records in today’s age. The aesthetically pleasing Victrola 8-in-1 wooden turntable combines modern technology with a nostalgic design. It gives off a unique retro vibe as the lavish real wood construction adds more to the turntable design. It is a complete entertainment solution to quench your thirst for good quality music. It even comes with a 3.55mm aux-in cable that allows you to connect the turntable with devices that don’t support Bluetooth technology. The fully functional remote control allows you to operate it from a distance without the hassle of manually operating the turntable. So, whether you want to play a Beatles’ classic or some new music number from your smartphone, this 8-in-1 turntable is bound to provide you with a captivating experience. Three-speed Turntable (33 1/3, 45, 78 RPM) plays all of your vinyl records and favorite Albums. Luxurious real wood construction. Record directly from vinyl, CD, and cassette directly to USB. No computer needed. Cord length: 60 ft.
Built-in CD player, Cassette player and AM/FM radio with old fashioned rotary tuner. Includes full function remote control and stereo speakers. The luxurious-looking BT500 turntable comes with a decent design that will make vintage turntable fans go crazy. It also comes with modern advancements such that it levels with the modern turntables of our times. The retro-style audio kit is complemented by aluminum platter and provides stability to the vinyl. The belt-drive action is smooth and consistent. There is no obvious drifting or warbling. The sound comes off clean, rhythmic, and dynamic as you can clear separation of different instrument sounds. There is no apparent trade-off between sound quality and aesthetics. This beautifully crafted – with its walnut and metal finish – turntable is an appropriate choice for the style-conscious anglophile. You’ve had a chance to go through our top 10 choices ranging from the secondhand vintage turntables to vintage turntables with modern features. I hope you found this article informative and helpful.